Low Back Pain is well known to at least 80% of people. The cause can be ascertained in many cases with the help of modern diagnostic techniques such as MRI. In other cases, these modern diagnostic techniques only serve to exclude all known and understood causes leaving "Non-Specific Low Back Pain"
as seen in lateral x-ray, should always be maintained. 1) Is this suggestion supported by any published work? 2) Is there a therapy corresponding to this? 3) Why has this strange shape evolved in the human spinal column? Columns are straight! 4) What is the pain causing mechanism? 5) Why is the pain so severe and so persistent? 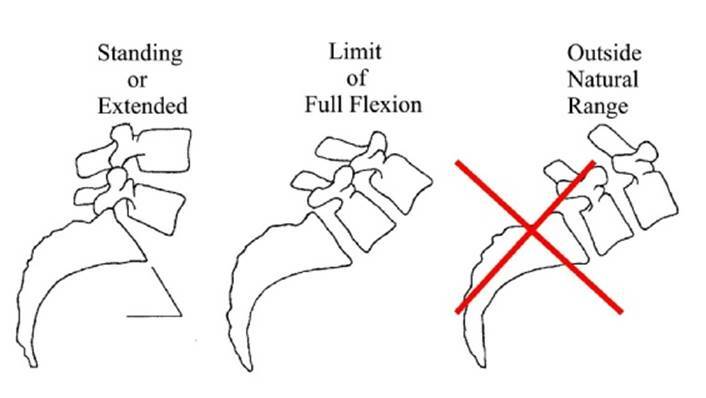 7) What causes flexion to be excessive in an individual? 8) Will flexion beyond this parallel sided limit always cause pain? 9) Is this flexion limitation to be found in all of us? 10) If the answer to question 7 is the cause, what is the solution? 11) How is this connected with disc degeneration? 12) I don’t understand the argument! 13) What Seating products are available? chair. Some of these are products sold by Pelvic Posture Ltd or Gorman Design Ltd but many were prototypes. The next page attempts to put this into some logical grouping.